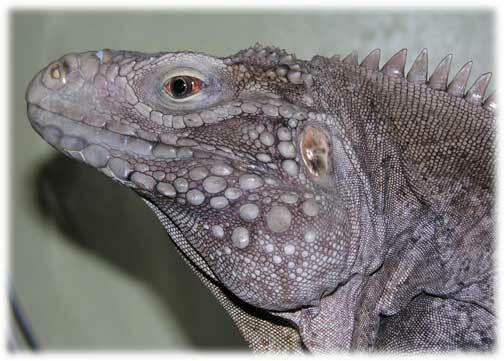 Cyclura iguanas or "Rock Iguanas" as they are generally called are a large, heavy species. They may not get as long as a Green Iguana but they can weigh nearly two times as much. I personally keep one male Cayman Brac iguana (Pete) who is 6 years old (2006), a female rhino iguana (Kharma) who is 5 years old at this time and a "baby" Rhino from eggs I hatched for someone else in the Fall of 2003 (Diego Garcia) who has turned out to be a female. I raised a lewisi hybrid from a 9 month old to a nearly 3 year old but lost her due to complications of egg laying and the surgery to remove the eggs during the summer of 2003 (Tashmoo). Her page can be viewed here. Pete, Kharma and Diego only arrived here in 2003. Pete in May and Kharma as a rescue in September. I learned lots about Cyclura raising Tashmoo but have learned even more in the several years Pete, Kharma & Diego have been here. Kharma came with a host of issues including gout and some fairly serious burns. Her diary can be seen here. Cyclura.com - lots of conservation and pictures. Some care information. Marie Eguro's Baby Sapphire Page - First hand account of a baby lewisi cross. Care sheet. Photos of my Cyclura and others can be viewed here.